At UFC 234 earlier this month, the UFC went back down under as they touched down in Melbourne, Australia for their first pay-per-view event of the year. In the main event, we were expecting to see a middleweight title bout between the champion, Robert Whittaker and the challenger, Kelvin Gastelum. Unfortunately, a collapsed bowel and hernia would prevent the champion from making that walk. 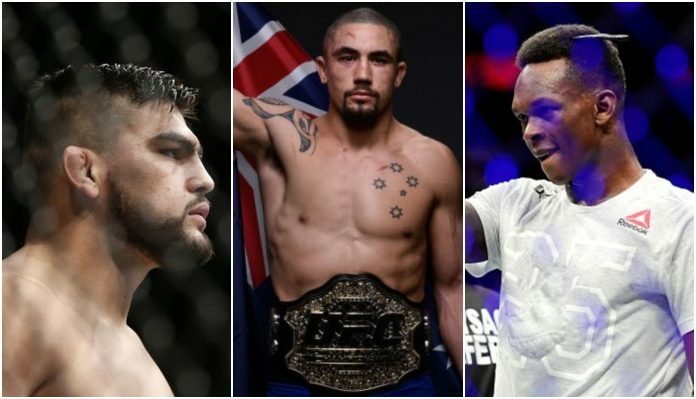 In his absence, an interim champion will now be crowned as Gastelum is set to face off with Israel Adesanya at UFC 236 on April 13. When it comes to who the champion would rather face upon his return, he has no preference. But he does think he matches up better with one over the other. “I think, stylistically for us, Adesanya matches up better for me,” Whittaker said on Ariel Helwani’s MMA Show. “I think I can get inside his guard and I can put heat on him. I think Gastelum is a hard fight because he’s a tough guy with a thick head and he would have just put the pressure on, put the pace on. I think Adesanya doesn’t like pacing like that in that sort of way, I think he would try and play a distance game with me which I’m very happy to do, but I’m very quick and I surprise a lot of people with that. For Adesanya, his last fight came at the aforementioned UFC 234 as well as he took on the legendary former middleweight king, Anderson Silva. The ‘Stylebender’ Adesanya would end up earning the unanimous decision in a striking-heavy affair. Despite the win being the biggest of Adesanya’s career when it comes to name value, Whittaker wasn’t too impressed. “I wasn’t impressed with his performance against Anderson,” Whittaker said. “If anything, I was impressed with Anderson’s performance against Adesanya. Anderson is not in his heyday anymore. He’s easily on his way out. Everyone can see that. And for Anderson to put up such a good fight… You know, I gave Anderson that second round. For him to put up such a good fight against a dude who’s on a tear with such a high-level striking skillset, and is running through people, I thought props to Anderson. “Adesanya’s very good. Don’t get me wrong. I just think he’s trying to build a hype train that doesn’t exist.